Both of our fan stories this week come all the way from the Emerald Isle, where Ben and his friends enjoyed a golf vacation in June of 2012. And both gentlemen said they felt very lucky to have met Pittsburgh’s Big Ben during his trip to their beautiful country. 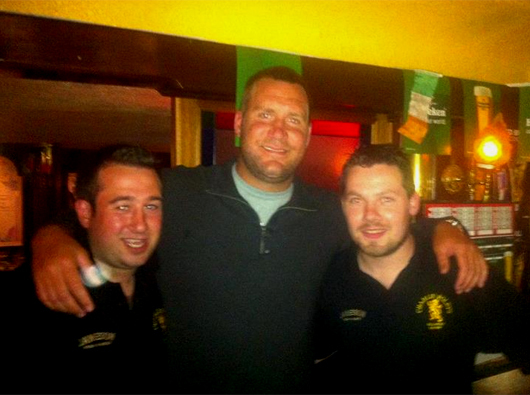 June, 2012: Ben poses with James Hurley (left) and Jeremiah Buckley at Charlie Foley’s Pub in Killarney in County Kerry, Ireland. Ben also found a fan on one of Ireland’s most beautiful golf courses! 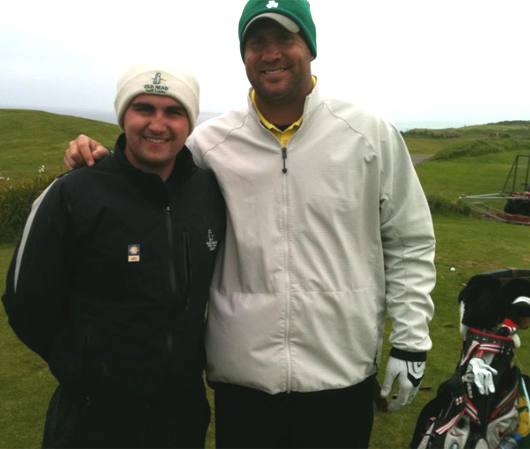 June, 2012: Ben poses with James Cullinane on a chilly day on the course. Thank you to James Hurley and James Cullinane for sharing their photos and stories! You can check out more fan stories and photos, including a few from Ben’s trip to Ireland and Scotland here (the photos and stories from his trip begin on page 6, bottom row).